I think I am confused ......... Aswan?? No - he's closer up in the pedigree - a great grandparent of the above horse, which I'm sure you've already guessed. If you haven't, here's another photo of him. Well then, it has to be him, hasn't it? It is most certainly Kilimandscharo - the beautiful and exotic Aswan son who is the great grandfather of Padrons Psyche through Kilifa / Kilika. Anne, id love to but i cant even get ANY picture up let alone one with a bit removed!! Ok Ive got one then who do these beautiful eyes belong to? Should be easy im sure many of you have seen this photo before! Could it be Gelgelah Al Badeia? Nope sorry all wrong! keep guessing! Ok he is related to Thee desperado. I also know I have seen the photo, but am being very dense, any more clues? 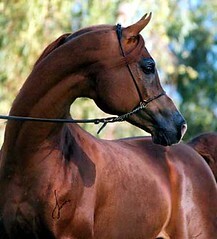 He is straight egyptian bred in Israel and Thee desperado is his greatgrandsire! I thought this one would have been easy heres the full picture im sure you will get it straight away now! Hi, is it Shaikh AL Kuran? 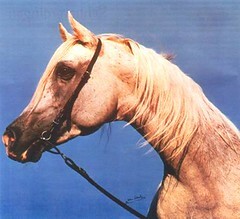 another clue Thee Desperado is great grandsire on the dam side! 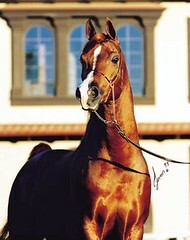 out of The Vision HG by Thee Desperado and bred by Ariela Arabians in Israel.